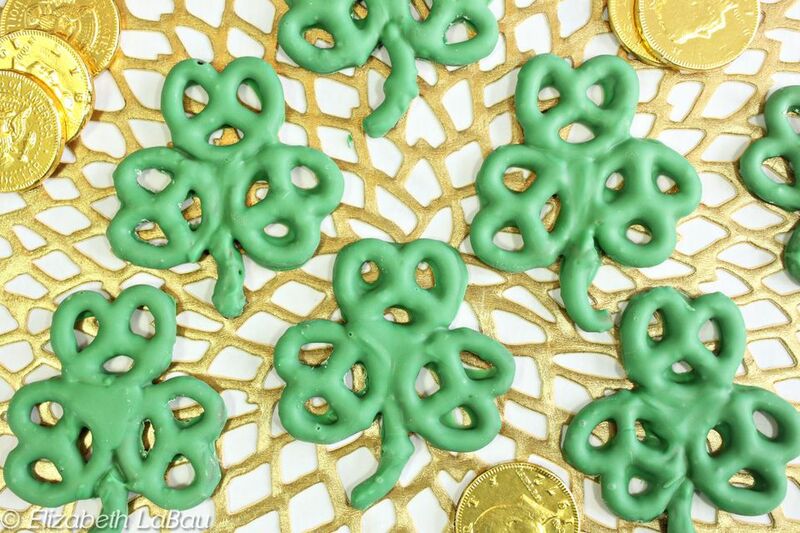 Shamrock pretzels are a fast and easy St. Patrick's Day candy recipe. This one is perfect for kids to help with! All you need are pretzels, green candy coating, and the patience to arrange them into shamrock shapes. We think these make a cute candy on their own, but they also make fun toppers for St. Patrick's Day cakes or cupcakes! Place the green candy coating in a microwave-safe bowl. Microwave in 30-second increments, stirring well after every 30 seconds, until the coating is melted and smooth. Cover several baking sheets with waxed paper or parchment paper. Dunk a pretzel in the melted coating until it's completely covered. Take it out of the coating using a fork or dipping tools, and let the excess drip back into the bowl for a few minutes. Place the pretzel on the baking sheet. Repeat with a second pretzel, and when you place it on the baking sheet, position it so that the bottom of the second pretzel is touching the bottom of the first. Repeat a third time, and this time, place the pretzel at the top of the other two so that they form a shamrock shape. Break a pretzel twist in pieces, so that you have a few short segments that can be the stems. Dip one stem piece in the coating, then position it at the bottom of the shamrock. Dip a small spoon in the coating, and use it to add a dollop of coating in the center of the shamrock, just so that it has a smooth, even surface. Repeat with the remaining pretzels and coating, until you've made 24 shamrock shapes. Refrigerate the trays to set the shamrocks, for about 15 minutes. When set, use a paring knife to trim away any stray coating from the edges of the shamrocks. You can store these in an airtight container at room temperature for up to 2 weeks. These also make really cute edible cupcake toppers!